Most businesses can benefit from real-time data on productivity levels or from information on which machines are performing best. When will connected devices have the ability to integrate with operations and enterprise resource planning (ERP) systems? Isn’t it time that IoT brought some of its power to the heart of business? The reality is this: the industrial internet of things (IIoT) is already upon us. Businesses are expected to put over 7.5 billion connected things into their operations in 2020. At the same time, manufacturing, transportation and logistics, and utility industries are projected to spend $40 billion on its platforms, systems, and services that will deepen the integration with their connected devices. The next phase is the union of IIoT and ERP that will help businesses improve productivity and achieve the highest level of M2M (machine-to-machine) communication. It feels like the magic of movies. As the “future” of operations becomes today’s new reality, the loop between machines and real-time communications is happening. Machines aren’t replacing employees, but they can optimize employee time to create new revenue streams and data analyses. Additionally, digital transformation isn't so cost-prohibitive that only those mega-corporations with seemingly unlimited budgets and IT resources can take advantage of it. Today’s technology innovations are enabling businesses of all sizes to take advantage of IoT, IIoT and business operation integration trends. The next phase of this transformation involves what was once hallowed ground: ERP systems. For decades, the ERP system has been a critical resource for businesses. Long before IoT was on the radar, today’s mega ERP vendors like, Oracle and SAP, were building their prowess. Legacy ERP systems were not designed to absorb information from a global network of sensors. And, of course, as organizations expand their digital transformation, it isn't just one type of equipment that will ultimately be integrated. Some estimates claim that it can take up to 25 technology partners to complete an IoT system for a business. Depending on the age and structure of the ERP, integration with IoT data can be a daunting task. Adding further complication, many ERP systems are never fully implemented. (Don’t miss our related blog, Costly ERP Mistakes You Never Want to Make). Those companies that start with multi-phased approaches – and then become fatigued halfway through – will face greater obstacles when they try to integrate the ERP software with new data sources. Moreover, we can’t forget the on-premise vs. cloud debate. Industry experts have been forecasting the end of on-premise ERP systems, but a majority of companies still rely on those systems today. On-premise ERP systems can require additional software implementations and infrastructure to become current with the latest release. Often newer releases are designed with tools for integration. With all those considerations, maybe it isn’t surprising that only 16% of North American industrial companies surveyed by IFS reported consuming IoT data in their ERP systems. For businesses wrestling with the question of uniting their IoT and IIoT equipment with their business operation and ERP systems, the benefits often outweigh the challenges. 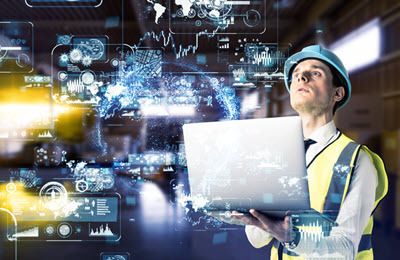 As sensors and connectivity become standard for industrial equipment, organizations that don’t capitalize on this data will face real competitive disadvantages. The actionable insights provided by IoT and IIoT technology have the potential to move business responses from reactionary to proactive. The question is how you move from the vision of an IoT and ERP union to reality. As organizations consider upgrading their legacy ERP systems, hybrid or cloud-based ERP becomes much more advantageous. Traditionally, ERP systems were so complex and labor intensive, that no one wanted to touch something that wasn’t broken. Cloud technologies are starting to change this thinking. The ability to harness a cloud or hybrid-cloud environment to drive down infrastructure costs enables greater flexibility and speeds the expansion of services with compelling advantages. So how do you take the first step with your legacy platform? For organizations that are running legacy applications on the IBM i platform, it’s necessary to do an assessment of your platform to ensure you have a solid understanding of its capabilities. Understanding the capabilities of your platform -- whether at the database level or in terms of its infrastructure level -- is critical to the creation of an intelligent plan to move forward with; one that will help you develop a more generic interface between your ERP applications and all the advantages of the hybrid world. Just remember, moving your ERP to the cloud or operating a hybrid-cloud isn't accomplished with a snap of your fingers. It is complex, and integration issues can be challenging. That said, a hybrid-cloud environment could be the first step in realizing the real power of digital transformation for business; one that moves your ERP software from a reporting functionality to a revenue-enhancer that drives proactive changes to empower your organization. The future is here. White Paper: Is Your ERP Keeping Up?